Google participated at this year’s WordCamp US, in Nashville, TN. One of the aspects that impressed me the most was the last day of the event, Contributor’s Day; a full day when part of the WordPress community convenes to contribute with WordPress. This is how it works. The WordPress open source community is organized as a group of teams; each with an area of specialty: Design, Mobile, Accessibility, etc. Contributor’s Day is a day when contributors get together to work on projects and teams of their choosing. Some are long time seasoned contributors, while others are newcomers that want to learn how to contribute back to WordPress and do so for the first time. At the end of the day, a long line forms at the front of the room, with one representative from each team summarizing what their respective teams accomplished, learned, and started to work on during the day. Witnessing Contributor’s day was an experience of open source organizing at its best. 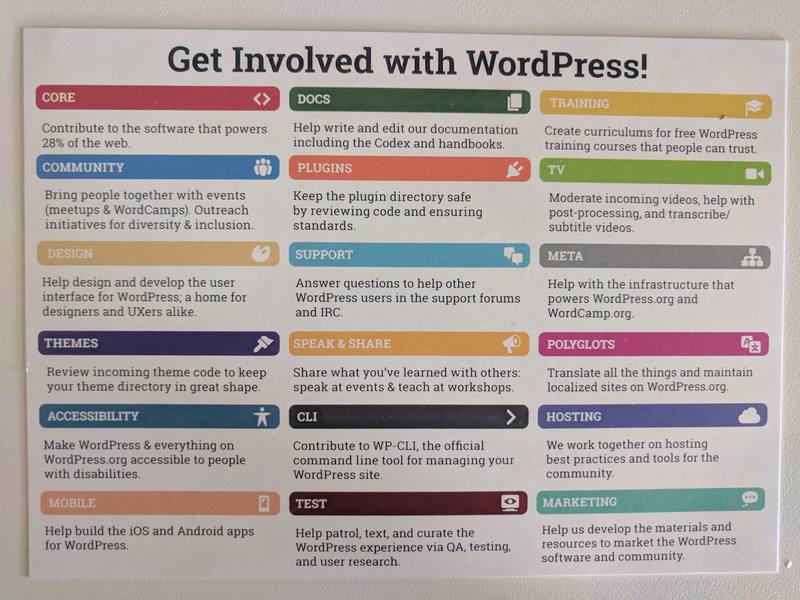 I would say that every open source community, at the scale of WordPress community, would benefit from the community organizing wisdom of the WordPress community.